To have the 3508-hectare Mount Seymour Provincial Park right in our Greater Vancouver backyard is such a blessing. All of us, whether nature enthusiasts, hikers, skiers or mountaineers, would enjoy the serene forest cover of hemlock, Douglas fir and red cedar. My wife and I, along with our three sons, have enjoyed many pleasant hours hiking along the Mt Seymour trails, especially on the Baden Powell Trail that ends up down in Deep Cove. In the last number of years that we have been hiking on Mt Seymour, I have often wondered just whom Mt Seymour was named after. After being given a fascinating book entitled ‘British Columbia Place Names’, I discovered that Mt Seymour is named after the first Governor of the united British Columbia colony, Frederick Seymour. Even though Frederick Seymour has been described as the forgotten governor, his namesake is found scattered all throughout our local community. Examples are Mt Seymour Lions, Mt Seymour Dry Cleaners, Mt Seymour Little League, Mt Seymour Soccer, Seymour Dental Centre, Seymour Animal Clinic, Seymour Golf & Country Club, Seymour Heights Elementary School, and the 11th & 13th Seymour Scouts, Cubs, and Beavers. Even SeyCove High School is a combined name involving Seymour, as well as Deep Cove. The more I learned about the Seymour connection, the more curious I became about just who Frederick Seymour was and why so many things were named after him, including Seymour Creek, Seymour Arm, Seymour City, and S eymour Street in Vancouver. I discovered that Seymour was born in Belfast, Ireland on September 6, 1820 to a formerly wealthy family that had just lost its properties, position, and paycheck. Through a family friendship with Prince Albert, Seymour was appointed as assistant colonial secretary of Tasmania. 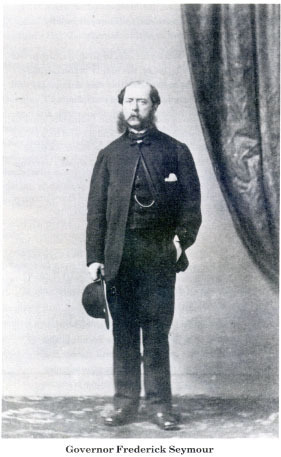 Before being appointed as Governor of the mainland colony of British Columbia in 1864, Seymour also served in Antigua, Nevis, and finally as lieutenant governor of British Honduras for 16 years. The Duke of Newcastle chose Seymour for BC because he saw him as ‘a man of much ability and energy’. Seymour was thrilled at the ‘prospect of a change from the swamps of Honduras to a fine country’. Frederick Seymour got along well with the citizens of the capital city of New Westminster. He upgraded their school, made personal gifts of books and magazines to their library, built a 200-seat ballroom, and encouraged the growth of cricket, tennis, & amateur theatre. He also ambitiously attempted to complete Sir James Douglas’ great highway to the interior of BC, but the financial costs of construction were staggering. As the interior BC gold rush began to slump in 1865, Seymour went to England in a bid to cut costs by consolidating the two colonies of Vancouver Island and the Mainland. The British Government endorsed Seymour’s plan which resulted in the abolition of the Vancouver Island House of Assembly and the establishment of New Westminster as the sole capital of BC. Victoria was outraged that it ceased to be a capital and lobbied successfully to move the BC capital back to Victoria. Seymour grudgingly was forced to move from his beloved New Westminster to Victoria where he was deeply disliked by many locals. Despite such Islander animosity, Seymour was able to establish the BC public school system, improve the courts, draw up public health regulations, set standards for mining, and reduce the provincial debt. Seymour’s provincial recall campaign never had a chance to get off the ground, as Seymour was called up north to settle an inter-tribal war between the Nass and Tsimshian First Nations. Using the famous Anglican missionary William Duncan of Metlakatla as an interpreter, Seymour convinced the warring groups to sign a lasting peace treaty. On his way back, Seymour died in Bella Coola from one or more possible causes: dysentery, Panama Fever, and/or acute alcoholism. His convenient death paved the way for his opponents to sweep the memory of Seymour and his anti-Confederation feelings under the carpet. It is amazing to realize that when BC entered Confederation in 1871, BC had fewer than 40,000 people, of which almost 30,000 were First Nations people. Confederation for better or worse was the ‘watershed experience’ that defined our province. Seymour was an embarrassment to John A. Macdonald and friends. So Seymour the anti-Confederationist became the Forgotten Governor. In the same way that Seymour was a forgotten governor in the civil realm, God is so often a forgotten governor in the spiritual realm. It is time that we re-establish Jesus Christ in his rightful spiritual place as governor of our land. My prayer is that God may keep our land glorious and free and that God the forgotten governor may have dominion from sea to sea. – In order to obtain a signed copy of the prequel book Battle for the Soul of Canada, please send a $18.50 cheque to ‘Ed Hird’, #102-15168 19th Avenue, Surrey, BC V4A 0A5. For mailing the book to the USA, please send $20.00 USD. This can also be done by PAYPAL using the e-mail ed_hird@telus.net . Be sure to list your mailing address. The Battle for the Soul of Canada e-book can be obtained for $4.99 CDN/USD. Categories: BC, Canada, Frederick Seymour, history, Mount Seymour, Uncategorized | Tags: 11th Seymour Scouts, 13th Seymour Scouts, Anglican Mission in the Americas (Canada), Antigua, BC Gold Rush, Belfast Ireland, Bella Coola, British Columbia, British Columbia Place Names, Bute Inlet, Chilcotin, Confederation, cricket, Deep Cove, Douglas Fir, Duke of Newcastle, First Nations, Frederick Seymour, Governor of BC, hemlock, hiking, Honduras, Jesus Christ, Metlakatla, Mount Seymour Provincial Park, mountaineers, Mt Seymour, Mt Seymour Dry Cleaners, Mt Seymour Lions, Mt Seymour Little League, Mt Seymour Soccer, Nass, nature enthusiasts, Nevis, New Westminster, Panama Fever, Prime Minister John A Macdonald, Prince Albert, Queen Victoria, Red Cedar, Seycove High School, Seymour Arm, Seymour Beavers, Seymour City, Seymour Creek, Seymour Cubs, Seymour Dental Clinic, Seymour Golf & Country Club, Seymour Heights Elementary School, Seymour Scouts, Seymour Street, Sir James Douglas, skiing, St. Simon's Church North Vancouver, tennis, theatre, Tsmishian, Vancouver Island, William Duncan | Permalink.